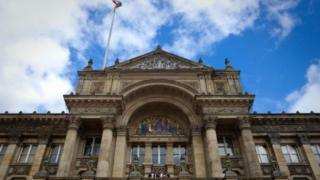 Image caption Birmingham City Council said there was no need for "undue concern"
More than 80% of council-run schools in Birmingham could contain asbestos. A freedom of information request made to the city council revealed that 161 of the 192 schools it is responsible for has the potential to contain the material. The council said there was no need for "undue concern". "There is always a chance that any building built before 2000 may contain asbestos," a spokesman said. Asbestos gives off fine fibres which can be breathed in and remain in the lungs potentially leading to diseases such as lung cancer. Responding to the figures obtained by the Local Democracy Reporting Service, councillor Ken Wood, said: "Whilst it is understandable that parents may be concerned by these statistics, the Health and Safety Executive (HSE) are clear that as long as asbestos is in good condition and is not disturbed or damaged there is negligible risk. "There is no reason for anyone to be unduly concerned," he added. Of the 192 schools, 164 are local authority owned and maintained, while 28 are local authority maintained but not owned by the council. Asbestos in schools: Is it a danger? Nationally, at least 319 school teachers have died from mesothelioma since 1980, with 205 of those occurring since 2001, the National Education Union says. The HSE says that, if properly managed, asbestos presents a "very low risk" to people in school buildings. The city council said it would not be naming the schools involved.